Lowdown: A new anchorwoman creates havoc at the TV station. With Anchorman 2 grabbing a lot of media attention, we decided to finally give 2004's Anchorman a chance. If only to examine why it took 'em a decade to come up with a sequel. In retrospect, we should have known better. Anchorman is another member of the "let the gang of boys have silly fun" genre of movie, as made famous by Judd Apatow. 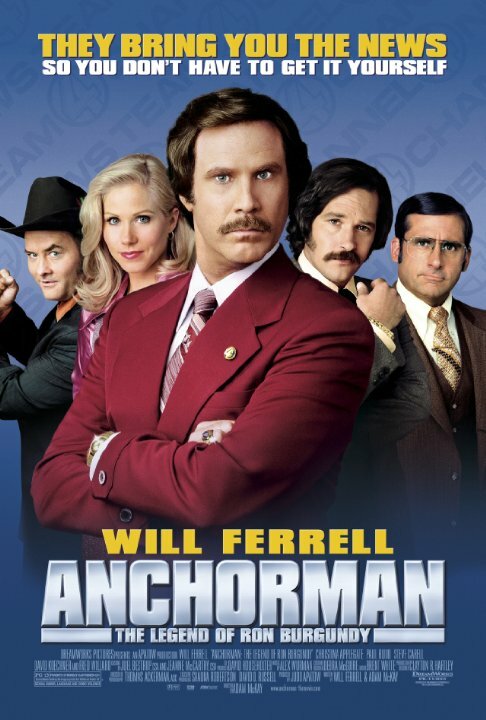 In the specific case of Anchorman, our gang of immature boys includes names such as Will Ferrell, Paul Rudd, Steve Carell and plenty of cameos by regular members of the gang such as Seth Rogen. Our story is set in seventies/eighties San Diego. A local TV station rules the ratings with its news show, anchored by Ron Burgundy (Ferrell) and supported by a crew of other men. The key point being they're all men working in a men's world. Our men's world comes into turmoil when the station recruits a new employee, and she happens to be a woman (Christina Applegate). The boys simply do not know how to digest this new intrusion into their world. The result? A very silly film that tries to make the most of the sexual revolution that took place since, with women now being accepted as capable equals (at least in some fictitious PC universe). It's never made clear whether all the chauvinistic jokes are genuine or whether they are there in order for us viewers to laugh at the misanthropic idiots uttering them; I suspect the film is designed to work both ways. The question is how good that humour style is for you. Me, I've fed up of it by now, but to be honest I always deemed it too silly. Your mileage may vary, but if you were to ask me whether Anchorman is a hit or a miss I would go with the latter. Best scene #1: There aren't that many good jokes in Anchorman, and the scene where rivalling news crews are having a fight that's almost to the death is not exactly one of them. It is, like the bulk of the rest of this movie, too silly. However - the fact this scene provides cameos from Tim Robbins and Ben Stiller, amongst others, makes it shine. The result is that Anchorman's version of West Side Story catches fire. Best scene #2: Jack Black, in his cameo, goes through a bout of Road Rage towards our Ron Burgundy. He picks Burgundy's cute little dog and kicks it, football style, from the bridge they're at to the water below. What can I say? I like it when films go so politically incorrect in previously untested directions. Overall: At the risk of repeating myself, I don't particularly like this type of humour. 2.5 out of 5 stars will stop me from rushing to see the sequel.